Create a HTCondor grid mapfile. Glideins start but fail before running job with error "Proxy not long lived enough"
This document describes how to install a Glidein Workflow Managment System (GlideinWMS) Factory instance. This document assumes expertise with HTCondor and familiarity with the GlideinWMS software. It does not cover anything but the simplest possible install. Please consult the GlideinWMS reference documentation for advanced topics, including non-root, non-RPM-based installation. In this document the terms glidein and pilot (job) will be used interchangeably. WMS Collector / Schedd: A set of condor_collector and condor_schedd processes that allow the submission of pilots to Grid entries. We really recommend you to use the OSG provided Factory and not to install your own. A VO Frontend is sufficient to submit your jobs and to decide scheduling policies. And this will avoid for you the complexity to deal directly with grid/cloud sites. If you really need you own Factory be aware that it is a complex component and may require a non trivial maintenance effort. A host to install the GlideinWMS Factory (pristine node). Currently most of our testing has been done on Scientific Linux 6 and 7. Disk: 10GB will be plenty sufficient for all the binaries, config and log files related to GlideinWMS. If you are a large site with need to keep significant history and logs, you may want to allocate 100GB+ to store long histories. The GlideinWMS Factory installation will create the following users unless they are already created. condor none HTCondor user (installed via dependencies). gfactory none This user runs the GlideinWMS VO factory. It should be the gfactory group. If you get another one, you just need to modify the PrivSep Kernel configuration file /etc/condor/privsep_config as indicated above and establish the corresponding GID. The lists that you see in this file, specify the IDs of all users and groups that HTCondor jobs may use on the given execute machine. In other words, users and groups that HTCondor will be allowed to act on behalf of. Here are instructions to request a host certificate. The host certificate/key is used for authorization, however, authorization between the Factory and the GlideinWMS collector is done by file system authentication. It must be on the public internet, with at least one port open to the world; all worker nodes will load data from this node trough HTTP. Note that worker nodes will also need outbound access in order to access this HTTP port. Most required software is installed from the Factory RPM installation. HTCondor is the only exception since there are many different ways to install it, using the RPM system or not. You need to have HTCondor installed before installing the GlideinWMS Factory. If yum cannot find a HTCondor RPM, it will install the dummy empty-condor RPM, assuming that you installed HTCondor using a tarball distribution. If you plan to send jobs using direct batch submission (aka BOSCO), then you need also the condor-bosco package. You'll have to install the package and remove one of its files /etc/condor/config.d/60-campus_factory.config because it interferes with the Factory configuration. Install the RPM and dependencies (be prepared for a lot of dependencies). This will install the current production release verified and tested by OSG with default HTCondor configuration. This command will install the GlideinWMS Factory, HTCondor, the OSG client, and all the required dependencies. yum install --enablerepo=osg-testing glideinwms-factory: The most recent production release, still in testing phase. This will usually match the current tarball version on the GlideinWMS home page. (The osg-release production version may lag behind the tarball release by a few weeks as it is verified and packaged by OSG). Note that this will also take the osg-testing versions of all dependencies as well. yum install --enablerepo=osg-upcoming glideinwms-factory: The most recent development series release, ie version 3.3.x release. This has newer features such as cloud submission support, but is less tested. You will need to download HTCondor tarballs for each architecture that you want to deploy pilots on. At this point, GlideinWMS factory does not support pulling HTCondor binaries from your system area. Suggested is that you put these binaries in /var/lib/gwms-factory/condor but any gfactory accessible location should suffice. The configuration file is /etc/gwms-factory/glideinWMS.xml. The next steps will describe each line that you will need to edit for most cases, but you may want to review the whole file to be sure that it is configured correctly. This is a snippet from the Frontend configuration (for reference), not the Factory that you are configuring now! comment="Define factory collector globally for simplicity"
<security classad_proxy="/tmp/vo_proxy" proxy_DN="DN of vo_proxy"
security_name="The security name, this is used by factory"
Entries are grid/cloud endpoints (aka Compute Elements, or gatekeepers) that can accept job requests and run pilots (which will run user jobs). Each entry needs to be configured to communicate to a specific gatekeeper. <entry name="ENTRY_NAME" enabled="True" auth_method="grid_proxy" trust_domain="OSG"
You will need to modify the entry name and gatekeeper. This will determine the gatekeeper that you access. Specific gatekeepers often require specific "rsl" attributes that determine the job queue that you are submitting to, or other attributes. Add them in the rsl attribute. Also, be sure to distribute your entries across the various HTCondor schedd work managers to balance load. To see the available schedd use condor_status -schedd -l | grep Name. Several schedd options are configured by default for you: schedd_glideins2, schedd_glideins3, schedd_glideins4, schedd_glideins5, as well as the default schedd. This can be modified in the HTCondor configuration. Add any specific options, such as limitations on jobs/pilots or glexec/voms requirements in the entry section below the above line. 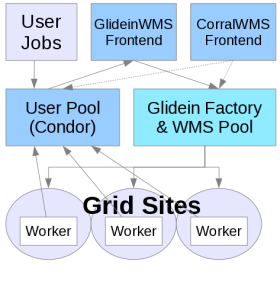 More details are in the GlideinWMS Factory configuration guide. !!! warning If there is no match between auth_metod and trust_domain of the entry and the type and trust_domain listed in one of the credentials of one of the Frontends using this Factory, then no job can run on that entry. The Factory must advertise the correct Resource Name of each entry for accounting purposes. Then the Factory must also advertise in the entry all the attributes that will allow to match the query expression used in the Frontends connecting to this Factory (e.g. <factory query_expr='((stringListMember("PINKVO", GLIDEIN_Supported_VOs)))'> as explained in the VO frontend configuration document ). Keep an eye on this part as we're dealing with singularity. Then you must advertise correctly if the site supports gLExec. If it does not set GLEXEC_BIN to NONE, if gLExec is installed via OSG set it to OSG, otherwise set it to the path of gLExec. <attr name="GLIDEIN_Supported_VOs" const="True" glidein_publish="True" job_publish="True"
<attr name="GLEXEC_BIN" const="True" glidein_publish="False" job_publish="False" parameter="True"
<attr name="GLIDEIN_Resource_Name" const="True" glidein_publish="True" job_publish="True"
Specially if jobs are sent to OSG resources, it is very important to set the GLIDEIN_Resource_Name and to be consistent with the Resource Name reported in OIM because that name will be used for job accounting in Gratia. It should be the name of the Resource in OIM or the name of the Resource Group (specially if there are many gatekeepers submitting to the same cluster). Each pilot will download HTCondor binaries from the staging area. Often, multiple binaries are needed to support various architectures and platforms. Currently, you will need to provide at least one tarball for GlideinWMS to use. (Using the system binaries is currently not supported). Download a HTCondor tarball from here. Suggested is to put the binaries in /var/lib/gwms-factory/condor, but any factory-accessible location will do just fine. Remember also to modify the condor_os and condor_arch attributes in the entries (the configured Compute Elements) to pick the correct HTCondor binary. Here are more details on using multiple HTCondor binaries. Note that is sufficient to set the base_dir; the reconfigure command will prepare the tarball and add it to the XML config file. The HTCondor configuration for the Factory is placed in /etc/condor/config.d. Credentials of the machine. You can either run using a proxy, or a service certificate. It is recommended to use a host certificate and specify its location in the variables GSI_DAEMON_CERT and GSI_DAEMON_KEY. The host certificate should be owned by root and have the correct permissions, 600. HTCondor admin email. Will receive messages when services fail. The above procedure will work if you are using the OSG HTCondor RPMS. You can verify that you used the OSG HTCondor RPM by using yum list condor. The version name should include "osg", e.g. 8.6.9-1.1.osg34.el7. This HTCondor RPM uses a file /etc/condor/condor_config.local to add your local machine slot to the user pool. Note that the variable LOCAL_DIR is set differently in UW Madison and OSG RPMs. This should not cause any more problems in the Glideinwms RPMs, but please take note if you use this variable in your job submissions or other customizations. Lastly, verify the settings in /etc/condor/privsep_config. By default, the values in this file should not need to be modified. However, if your user/group differs from gfactory / gfactory, or if you are operating a Factory with multiple frontends, you will have to modify this file. This file controls the HTCondor root switchboard, which allows the Factory to change permissions of files, specifically the proxies and files passed to it by the frontends. Thus, the valid-called-uids and valid-caller-gids should match the user/group of your Factory user. The valid-target-uids and valid-target-gids should be a colon-separated list of all the frontend users and groups. This should match the security_classes section in /etc/gwms-factory/glideinWMS.xml. The HTCondor grid mapfile /etc/condor/certs/condor_mapfile is used for authentication between the glidein running on a remote worker node, and the local collector. HTCondor uses the mapfile to map certificates to pseudo-users on the local machine. It is important that you map the DN's of each frontend you are talking to. Each frontend needs a line that maps to the user specified in the identity argument in the frontend security section of the Factory configuration. Make sure the condor and gwms-factory services are stopped (in EL6 this will be done for you). Start the condor and gwms-factory services (see next part). /usr/sbin/gwms-factory reconfig "and your options"
And you can stop also the other services if you are not using them independently of the Factory. The complete validation of the Factory is the submission of actual jobs. You should have one "glidefactory" classAd for each entry that you have enabled. If you have already configured the frontends, you will also have one glidefactoryclient and one glideclient classAd for each frontend / entry. This will determine the location of your web server. Make sure that the URL is visible. Depending on your firewall or the one of your organization, you may need to change the port here and in the httpd configuration (by modifying the "Listen" directive in /etc/httpd/conf/httpd.conf). Note that web servers are an often an attacked piece of infrastruture, so you may want to go through the Apache configuration in /etc/httpd/conf/httpd.conf and disable unneeded modules. max_days it will be rotated. Further details are in the reference documentation. If you get messages such as these in the logs, the Factory does not trust the frontend and will not submit glideins. This error means that the frontend name in the security section of the Factory does not match the security_name in the frontend. This error means that the identity in the security section of the Factory does not match what the /etc/condor/certs/condor_mapfile authenticates the Frontend to in HTCondor (!Authenticated Identity in the classad). Make sure the attributes are correctly lined up as in the Frontend security configuration section above. Check the appropriate job err and out logs in /var/log/gwms-factory/client to see if any errors were reported. Often, this will be a pilot unable to access a web server or with an invalid proxy. Also, verify that the condor_mapfile is correct on the VO Frontend's user pool collector and configuration. If the glideins are running on a resource (entry) but the jobs are not running and the log files in /var/log/gwms-factory/client/user_frontend/glidein_gfactory_instance/ENTRY_NAME report an error like "Proxy not long lived enough (86096 s left), shortened retire time ...", then probably the HTCondor RLM on the Compute Element is delegating the proxy and shortening its lifespan. This can be fixed by setting DELEGATE_JOB_GSI_CREDENTIALS = FALSE as suggested in the CE install document. Make sure that you run service gwms-factory upgrade instead of the more light-weight service gwms-factory reconfig to ensure that all scripts are created correctly. Just make sure that gwms-factory is stopped. Next verify /etc/condor/privsep_config to make sure the users and groups are listed correctly. Lastly, verify that permissions are correct. The parent directories (all the way to the root) of all valid-dirs in the file must be owned by root.